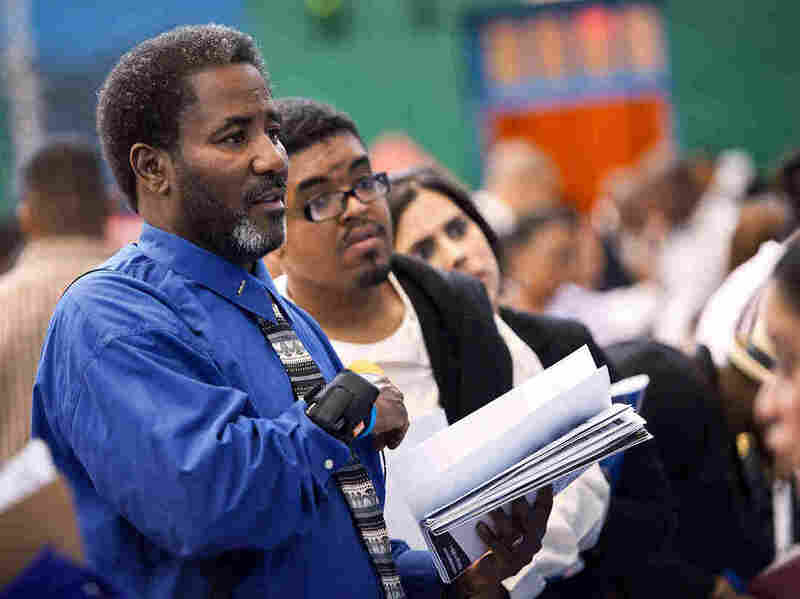 Employers Added 201,000 Jobs Last Month, Report Signals : The Two-Way The ADP National Employment Report has shown solid, not spectacular, job growth for two straight months. Meanwhile, another report finds a 20-month low in layoff announcements. Friday, the government issues its figures on August unemployment and jobs. The scene at a job fair in Harlem earlier this summer. Three bits of good news about jobs were just released. "Private-sector employment increased by 201,000 from July to August on a seasonally adjusted basis," according to the latest ADP National Employment Report. And ADP revised up its estimate of the job growth in July — to 173,000 from the 163,000 it previously reported. "The August increase of 201,000, following a solid gain in July, supports the notion that the underlying trend in hiring has picked back up after slowing sharply during the spring," Joel Prakken, economist and chairman of Macroeconomic Advisers, says in the ADP report. Also this morning, the outplacement firm Challenger, Gray & Christmas reported that the number of layoffs announced by U.S. employers hit a 20-month low in August. It said that companies "announced plans to shed 32,239 workers from their payrolls in August ... the fewest number of monthly job cuts by US-based firms since December 2010, when layoffs totaled 32,004." The firm cautioned against reading too much into the trend (layoffs have eased in recent months): "The three-month decline in the pace of downsizing may be further evidence of an improving economy or it may simply be a summer lull in jobcut activity." Finally, the Employment and Training Administration just said that there were 365,000 first-time claims filed for jobless benefits last week, down from 377,000 the week before. We'll hear much more about August's job growth and unemployment on Friday when the Bureau of Labor Statistics issues its data about the month. It's first swipe at July's figures put the unemployment rate at 8.3 percent and the number of jobs added to payrolls at 163,000. While the ADP report and the BLS report have in recent months tended to generally agree on the job market trends, they don't necessarily track each other closely on the specifics. Bloomberg News says the median forecast of economist it has surveyed indicates BLS will report Friday that payrolls rose by 127,000 in August and the jobless rate stayed at 8.3 percent. Prakken, though, says in the ADP report that the gain in jobs it detected "is strong enough to suggest that the national unemployment rate may have declined."